In a similar vein to what Smallville has done for the Superman mythos, Merlin updates the legend of the sorcerer from Arthurian legend for a new audience. The TV show follows a young Merlin as he secretly watches over the court of King Uther and a young Arthur. 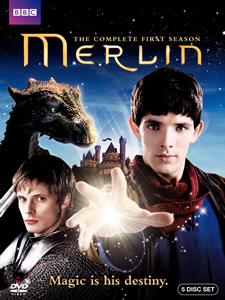 The series stars Colin Morgan as Merlin, Bradley James as Prince Arthur, Anthony Head as King Uther, Katie McGrath as Morgana, Angel Coulby as Gwen, Richard Wilson as Gaius, and John Hurt as the voice of the Great Dragon. Last summer, Merlin ran on NBC. The series wasn’t a big success for the peacock network but, thankfully for the show’s fans, it’s successful enough in England for the BBC to keep making the show. NBC cancelled the show in the US but it moved over to Syfy for season two. BBC One has already ordered a third round. Merlin: The Complete First Season has just been released on DVD and the set includes all of the episodes as well as featurettes, video diaries, photos, and wallpapers on five discs. You can purchase it for just $34.99 or, you can try to win a copy! To enter, you need to merely post a comment below and tell us the name of your favorite character or actor from the show. Be sure to leave your email address so that we can contact you with the good news if you win. Guidelines: This giveaway is open to participants with a United States mailing address only (international readers can enter if they have a friend in the States who can accept their prizes by mail.) Many may enter but one person will win. You must be 18 and older to enter and no purchase is necessary. Contest ends April 30, 2010. UPDATE: Congratulations to “Toby O’B.” For everyone else, thanks for entering and stay tuned. We’ll be have several more giveaways soon! My favorite character is Merlin, he is so cute…..
My favorite character, along with all the rest, is Merlin. He’s such a humorous character and is more important than most of them know. When he smiles, everything in him smiles and I cannot help but feel happy. Richard Wilson as Gaius is most consistent in delivering his lines with conviction. I love the character Merlin! He is so much fun to watch, especially as he interacts with Arthur. This show is the best!!! I used to like Merlin best, but I have come to really like Arthur because he is unintentionally humorous and because he truly cares about Merlin and his people. Bradley James was well-chosen for the role. I am especially thrilled to see that family programming has returned. I record this show because it comes on too late for my grandson to see, but it is one of our favorite programs to watch as a family. Please keep up the great work! As for the purpose of this contest; I will say that Arthur is my favorite; because his character humbles himself from time to time thus making him a true leader for his Camelot. I am really loving this show and do so hope that it continues on with the story. I am especially anxious to see Author finally become king and to find out the truth about Merlin. Merlin is my fave character, but Author is my second fave.